I have a card today that I'm sharing over at the Simon Says Stamp Wednesday challenge which is "anything goes." They're featuring Penny Black products, so I used this cute little PB image that I colored with Copics. I added some Glossy Accents to the boot for a little patent-leather shine! I made a herringbone background from some red, yellow and aqua dsp strips and then embossed the whole panel with a Hero Arts/Sizzix Chevron ef. The hedgie was looking up, so I gave him 3 turquoise butterflies to watch, done with a Punch-a-Bunch. 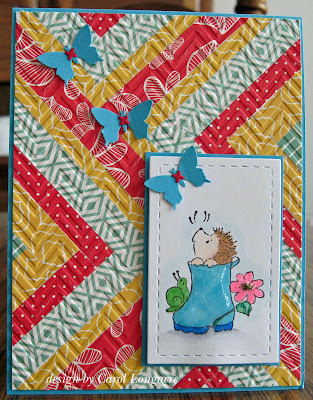 The butterfly centers are negatives from a Simon Says Stamp Pinpoint Border die. The card base and image mat are turquoise and the image panel was cut with a Lil Inker stitched rectangle die. Thanks for stopping by and I hope you're staying cool wherever you are. It's sweltering hot here in PA, so we're chilling in the air conditioning today! A fabulous card Carol, such a cute image and lovely herringbone background. Aww!!! Another fantastic look with this embossed puzzle of leftover strips!!! This is a genial technique, and gives a lot of interest to your card!! And you reduce your box of leftovers!! Love the turquoise butterflies and the cute hedgehog seems really look at them! Beautiful effect with the glossy on the boot! So harmonious and summer-like card, my friend! This is just super gorgeous. Love the background - or is that the quilter in me? That image is super cute. This is so cute and cheerful! I absolutely love the image you used. What an adorable card! Love it, Carol. The Glossy Accents really did give the boot the patent-leather look. Love your background, so vibrant and fun looking. Butterflies were the ideal embellishments. Very hot hear again today, Staying in for the rest of the day. Glad to hear you are doing the same. Everything about this card is wonderful, the image and the shiny boot, the butterflies and that great background. So cute! I love the vibrant background on the card too. Thanks for playing along Simon Says Stamp Anything Goes Challenge. WOW! This is fab, Carol. Love that background.